These weeks I managed to make quite a lot of progress. I´m checking all the rooms of the game, focusing on one aspect at a time, to make the tiresome tasks more fluid. Now the entire game has correct map coordinates data, the rooms position the map cursor correctly. The entire map was tweaked here and there, adding some parts of some areas that didn´t appear. Also, I finished connecting the last rooms. I managed to travel the entire "loop" from the spaceship to the Queen´s Lair and back to the surface in about 13 minutes (There´s a lot of rooms missing enemies). One of the things that always bugged me about the engine is that the Speed Booster visual effects make the game lag on some computers, including my laptop. So I replaced the old afterimage effect with a new one that uses only one object. Before this, each shadow behind Samus was a separate object. I´m planning more small optimizations to make the game run a little smoother. Hopefully, updates will begin to get interesting once I finish the level polishing part. It´s a lot of work, a lot of time, and there´s no pretty way of showing interesting screenshots. But you´ll experience solid environments when you play the finished game. Ok, like always, you´re welcome to post your ideas and discuss the project by commenting here or in the forum. Have a good week. I can't wait! I liked your last post very much. The original game has few rooms and many rooms are completely empty, without neither enemies nor items. It's gonna be awesome of you change these details. Remember, be discrete. I don't know if you've played Tomb Raider 1 and its remake, Tomb Raider Anniversary. If you look at that game, you'll know what I'm talking about, it's an awesome remake and is not too different from the classic. Of course Metroid is a completely different style. But many people (like me) didn't like Zero Mission, comparing to the classic, for being too changed. I wish the best for your job. Thank you for making this game for us all. I can't wait to play, man, really! I'm very excited! Since when did Samus get a map of SR: 388? Shouldn't the Chozo give it to her instead? Like maybe you could out ancient chozo map stations in the different areas. Unless it was mapped as she progressed, that would make sense. Im really looking forward to this game ive played confrontation a few times and am quite stoked to see a good looking 3rd party metroid :D Keep up the good work! Thanks for the update. Keep up the excellent work - it is MUCH appreciated! God bless you for freely giving all of us your efforts and hard work! I would make love to the ground you walk on. I'm assuming he means mapping the game out manually. Given the somewhat more lenient nature of a lot of Metroid II's secrets, I'm betting map upgrades won't necessarily be needed. Not that I'd complain if Doc does add them. Anyway, good to hear progress is steady. Keep it up. I know the work's annoying and repetitive, but so is anything truly worth accomplishing. You're doing the kind of work with a handful of people that it usually takes professionals of more than a dozen to do. As always, I'd still appreciate a percentage chart on your next update. We've haven't heard much about how far enemies, metroids, and the bosses are in development in quite some time. The problem with the afterimage effect is probably the multiple transparent layers overlapping each other. I've noticed this issue in GM more than once. You should try drawing a polygon with transparent fill behind samus. Basically you save the coordinates of her head and feet each step for 10 or 20 steps then draw the plygon bewteen these coordinates and each frame you dump the older coordinates from the tail and save the new ones on the head of the queue. Ths way you'll have a polygon taking the shape of the path. Sorry I can't be of more help. I haven't used GM since version 5. What about the queen? Will you show us some images or will you wait until completion? And what about some pictures of Samus for the end of the game? Sounds awesome! I so can't wait for this! I don't mind if there's no screenshots because it sounds like it's almost complete, and I can remember when you released the first demo (that was a while back :P) Keep going and make it the best you can! What the guy said about map is a good point. Well, Samus' suit's computer could draw a map automatically as she explores the place. But the whole maps could be hidden in Chozo ruins. I think the developer already thought about it, but it's good to make sure. Guys, I've been thinking about Metroid all the time this last 4 weeks! I'm dreaming of playing Other M and this remake. I'm visiting this website everyday. I'm getting obsessed for Metroid, it's the collest game series ever. i wish there was some way i could repay you for making this game. Feels like we're almost there! Kind D64 is a godsend to us. Never thought I would see it done. I have waited for a new 2d Metroid! Great job so far D64! Gonna play it day one. Everyone is probably excited as me. Really hope it goes smoothly! Hey, developer. I'm playing Metroid Confrontation. A training room, like the X-Men's Danger Room? Cool! I like the sound when Samus uses the spider-ball. The wall-jump seems to be easier, what is great - we know how difficult it is in Super Metroid. But her head disappears in the ceiling when she walks in short places. A part of her disappears too when she turns into a ball. The sounds when she's about to die or when she dies are missing - I think you should put the sounds of Super Metroid for these ones. Do you remember the 2 sounds when Samus takes items in Metroid 2? A little music for important items and a fast sound when she takes more missiles or energy. Well, I think you should take these sounds and improve them, then the game would be more alike the original. In the prime games when you were in the map you could scroll through each room with an analog stick to see the names of each room. Is that feature in the map engine? If not I think it would be a nice add-on. Hey, Doc, maybe you could put up a donation button AFTER the game is released so that we could repay you for the awesome game. Obviously it wouldn't be a good idea if you put it up beforehand or you might get a C&D from Nintendo for being paid. Isn't Samus too small in Metroid Confrontation? Don't you think she would be better with the same size of Metroid Fusion and Zero Mission? Well, that's just a detail, not important. I hope she's a little bigger, but the game is about to be released, so changing that would take too long. Nice to see progress on something I am keen to play. I've noticed you've used a lot of metroid metal in trailers etc, and I am curious if you want your own unique arrangements of the classic tracks for this remake, if you don't have some already? Might be able to organise something and send you some examples in a few months. I have a suggestion for after the fight with the omega queen. 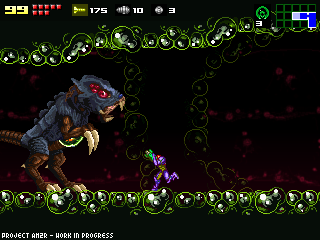 Why not have a few additional enemies wile you are escaping with the baby metroid? Whenever the metroid sees an enemy, it could fly back a bit and be too scared to continue until you defeat the enemy(s). You still would need the metroid to get through the diamond-wall things, so you have no choice but to kill the enemies. This is fantastic! I always wondered how much faster one could travel through SR388 if one only had an overland map. Even if it were just split of into regions and then sectors (and not necessarily room by room) it would have shaved a whole half hour off my completion time of the original game. Sorry, I'm not even the best in english but ehm, do you already now a data when you finished ? God its crazy to have been following this since 2008 and see how far its come along. I can't wait to see the final product! Keep up the great work Milton! Are the Omega Metroids gonna look anything like Metroid Fusions? GAH! TO LONG! Ok work at your own pace, but damn the anticipation is killing me. I've played through the demo like 12 or more times now and I keep forgetting that Nintendo didn't make this by the time I get the speed booster. This is probably the best fan game of all time...EVER! AND IT'S NOT EVEN OUT YET!! I'm sure this is going to be EPIC! I was thinkin maybe you could add equibable beams with unique benefits, sort of like in super metroid. The ice beam froze enemies but was weaker, so I sometimes unequiped it for a power boost for like bosses or tougher enemies immune to ice. Dude this is becoming so epic. I love what you have been doing and it all sounds like it's going to make anawesome final product. Keep up the good work Doc. Metroid Other M is one of the best Metroid games ever. But Metroid 2 is still my favourite. The metroids are more important in Metroid 2 than in any other. This game is all about fighting the metroids themselves, not those who use them against the Federation. The name of the species is title of the game series, by the way. It is also completely new and different from the 1st game, showing the evolution of the metroids, a totally different planet, etc. Just great! Pitty Metroid 2 is not as famous as other Metroid games because it was made for portable console. We can see games for other consoles are not as famous as games made for non-portable consoles, because most players don't have portable consoles, only non-portable. This remake is gonna be epic. It's gonna improve one of the coolest Metroid games ever. I'm only recently aware of the project but its completely obvious the challenge you've undertaken. Let me be not the first nor the last to say thanks for trying to put a little polish on such a worthy game from such an amazing game series. Keep your resolve, you'll be really proud in the end. Commenting what the guy asked before, I don't know if this is legal, but I think it would only be illegal if the developer was planning to sell it, but if I understand well he's going to release it for free download. wow it took me a long time to post this time XD. love the work and effort you put into this doc ur awesome. Que bien que esta quedando! Que lastima que falten años para jugarlo. Comencé a seguir este proyecto desde noviembre de 2009 y lo que has avanzado es impresionante. I'm looking forward to this release, heck, I might even buy a computer for this game! Just one question though... How hard is it to program a game engine in your opinion? I've been looking into computer programming as a positive intrest as a hobby and want to know what your experience is like. The "name thing" is difficult but even if you would name it "xyz" I woult love it, I think. What about "Metroid 2 Rebirth"
Hope to play it soon, greetings from Austria! Damn, it pisses me off how expensive video games are here in Brazil! The international trade makes them 70% more expensive than the original price in North America, Europe or East Asia. But the stores make it even more expensive, more than twice the price. I heard that a new PS3 game is 60 dollars in USA. Here it is 300 reals (=175 dollars), can you guys believe that! That's why Brazil is one of the countries in which piracy and free downloads are strongest. I rarely (so rarely!) buy an original game or movie or CD. Good thing Metroid 2 Remake is a gift from the developer to us. A great game, I can say! I already love this game and I still didn't see it released - I can't wait anymore, please, developer, send more news, at least! Thank you for this great job and for all your time. This project is really looking very good. Heck, it looks better than anything Nintendo could make IMO. Keep up the good work! I'm sorry I'm so excited, it's been 10 years...MEGA MAN LEGENDS 3!!!!! Hola, que requierimientos de PC va a necesitar? we should be thankfull he's kind to share this epic remake of a classic. Miguel is right, but I'm so excited to play this remake! This project began in 2008, but I first saw it few months ago. If I saw it since 2008 I'd already have gone crazy! Well, I hope the developer do his best (and he is doing) and release it soon, once, by his words, the game is close to be completed. DAMN, I LOVE METROID 2!!!!!! Hmm - you are positioning the map location per room? That's gotta require room specific code, right? I ran into that issue at one point too, and thankfully I kept a tradition of calling my rooms "X__Y__", so it was easy to interpret the room names into the map coordinates. As for rooms' internal GPS - I use a formula that breaks down the room into screen-widths, and offsets the GPS location based on which screen-width/height quadrant the player is located. Oh - and did you run into any issues with GM's tile engine? If you have any performance issues - I can offer a solution. Astounding! I just discovered this and am so happy that you have not received any cease and desist letters as of yet (knock on wood). I was just looking at Chrono Ressurection and that was pretty depressing.. I am planning to do a remake of EarthBound in 3d, fingers are crossed there. Props to you, the best of luck with the rest! I cannot wait for the game to be finished, but i can wait for you to make it as perfect as you see it in your mind ! My greatest fear for now is the C&D hammer. You, sir, are my hero! Ever since I first played Super Metroid, I've been clamoring for a remake of Metroid 2. As Jeremy suggested, we would love to repay you in some way, whatever that would be. 'Excited' doesn't even begin to describe it. Keep up the good work, Doc. I see a future, where you are forever, "The King of Metroid Fans."